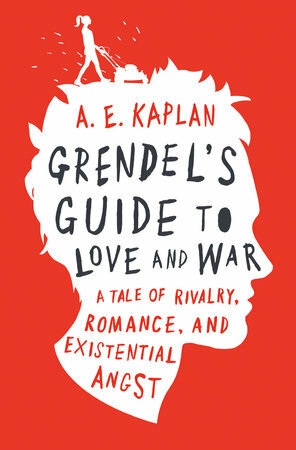 I don't have a lot of interest in teen angst, or maybe any kind of angst, so Grendel's Guide To Love and War, A Tale of Rivalry, Romance, and Existential Angst by A. E. Kaplan wasn't a big draw for me because of the angst there in the title. No, I picked up Grendel's Guide because of that word Grendel. It's a reference to Beowulf. Beowulf is my favorite epic. I spent some time ten years ago writing about it here. I did. That was the year of the Beowulf movie with Angelina Jolie. Probably not Beowulf's most glorious moment recently. That would be Seamus Heaney's version of Beowulf. Beowulf is the tale of a Dark Age warrior who helps out Hrothgar, King of the Danes, whose hall is attacked every night by the monster Grendel. Beowulf kills Grendel, which ticks off Grendel's mother, so Beowulf has to kill her, too. Then he goes home, lives into old age, has to fight off another enemy and doesn't survive it. The point being, in my mind, that we can do things when we are young that we can't do when we're old. That's life. My interest in Grendel's Guide was looking for Beowulf connections. Now, the big one, of course, is that the main character is named Tom Grendel, tying him to the Beowulf monster. Though this Grendel isn't at all monster-like. The Rothgar family moves in next door. Hrothgar, remember, was the name of the King of the Danes in Beowulf. One of the Rothgar teenagers is named Rex, a name that means king. Here's a particularly interesting bit: Rex Rothgar is a nasty piece of work, raising hell in a neighborhood of elderly people with loud music into the night, every night, tormenting Tom Grendel as well as his PTSD-suffering father. So here we have Rothgar tormenting Grendel instead of Grendel tormenting. Neat, huh? Also, Tom Grendel has that father, but no mother, because his mother is already dead. There is no Grendel's mother to seek revenge for her child. I didn't get the significance of all the old people. Unless they have something to do with my perception of the original material being about growing old. This is really embarrassing, but I kept looking for Beowulf in here and couldn't find him. It's embarrassing, because when I read the Author's Note at the end of the book, I figured it out, even though Kaplan didn't come right out and say who he was. It's embarrassing, because it should have been obvious. What was I thinking while I was reading this? Author Kaplan says in her Note that she first encountered Beowulf in her ninth grade English class. (I was a freshman in college.) Grendel's Guide would be a fun companion volume for teenagers reading Beowulf for the first time.